Internet Server Monitor is a network monitoring tool that enables systems administrators to automatically monitor the network for failures and recoveries. With the help of Internet Network Server Monitor, you will easily identify issues and fix unexpected conditions even before your users or managers report them to you. Internet Server Monitor maximizes network availability by monitoring network servers, services and applications (resources) running on your Windows and Linux servers, workstations, and devices such as routers. When a failure or recovery is detected, Internet Server Monitor can alert you remotely by email, pager or SMS, as well as on your desktop via system tray icon status and popup, sound, or message box. Failures and recoveries can optionally be logged to any Windows Event Log or your syslog server. Internet Server Monitor actually handshakes with network resources. In some cases specific functions are called enabling Internet Server Monitor to not only determine if a network resource is available, but the resource is functioning adequately. Internet Server Monitor uses the latest user interface components, is easy to set up and use and is priced well below our leading competition. Unlike much of our large corporate world competition, being a smaller software company enables us to quickly respond to feature requests with a typical turn around time of 2 weeks for simple requests and 1 month for significant requests. · Internet Network Server Monitor consists of a network monitoring service and a separate management interface. No agent software needs to be installed on the machines you wish to monitor. This software architecture allows for high reliability and scalability to monitor both large and small networks. · Microsoft SQL Server - Checks availability of SQL Server by establishing a connection and optimally running a SQL command. · ODBC - checks availability of any ODBC data source including support for popular databases such as Access, FoxPro, Paradox, SyBase, Informix, IBM DB2, and many more. · HTTP (Web) - Checks availability of HTTP and HTTPS sites; passes credentials if required, and optionally checks website content against a text pattern. · SMTP (Outgoing Mail) - Checks mail server by establishing a connection, handshaking, and optionally sending an email. · POP3 (Incoming Mail) - Checks POP3 servers by establishing a connection and handshaking. · FTP (File Transfer) - Checks availability of an FTP server/site by establishing a connection and handshaking. · ICMP (Ping) - Checks a remote host for availability by echoing data within a user defined timeout period. · NTP (Time Server) - Checks time server by establishing a connection, handshaking, retrieving the current time, and optionally setting the time on the local server. · NNTP (News Server) - Checks news server by establishing a connection, handshaking, and optionally, connecting to a news group. · TCP (Port Scanning) - Checks if a port is responding and optionally checks its response against a text pattern. · Email - Sends an email message. · Pager (SMS) - Sends a text messages using Clickatell's web email-to-SMS online gateway service or any third party email-to-SMS gateway. · Message Box - Displays a custom message box that stores alert history so your desktop does not fill with hundreds of messages. · Sound - Plays a sound. · Tray Icon - Updates the tray icon with the current global status. · Tray Icon Popup - Displays a balloon window above the tray icon that contains the failure or recovery. · Event Log Entry - Writes the failure or recovery to any Windows Event Log. · Syslog Message - Forwards the failure or recovery to your syslog server. 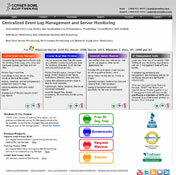 · Includes reports that detail the availability of your network resources and history of each network resource. · Logical group support provides support for organizing network resource monitors into groups limiting report content to specific network resources. · Configure maintenance periods to avoid alerts being sent during scheduled maintenance. · System tray icon status enables systems administrators to quickly see the status of all network resources regardless of the alert methods employed. · Logs all monitors to a text file and, optionally, to your syslog server. You cannot download any crack or serial number for Internet Server Monitor on this page. Every software that you are able to download on our site is legal. There is no crack, serial number, hack or activation key for Internet Server Monitor present here. Our collection also doesn't contain any keygens, because keygen programs are being used in illegal ways which we do not support. All software that you can find here is freely downloadable and legal. Internet Server Monitor installation package is prepared to be downloaded from our fast download servers. It is checked for possible viruses and is proven to be 100% clean and safe. Various leading antiviruses have been used to test Internet Server Monitor, if it contains any viruses. No infections have been found and downloading Internet Server Monitor is completelly problem free because of that reason. Our experts on malware detection tested Internet Server Monitor with various spyware and malware detection programs, including fyxm.net custom malware and spyware detection, and absolutelly no malware or spyware was found in Internet Server Monitor. All software that you can find on our servers, including Internet Server Monitor, is either freeware, shareware or open-source, some of the software packages are demo, trial or patch versions and if possible (public domain licence), we also host official full versions of software. Because we want to be one of the fastest download sites on the web, we host all the software including Internet Server Monitor on our servers. You cannot find here any torrents or download links that would lead you to dangerous sites. Rate Internet Server Monitor 10.0.0.54!